On Monday 4th April, an innocent civilian (name Yousuf) was martyred in his own house by local mercenary soldiers in ‘Sini’ village of ‘Shilgar’ district in ‘Ghazni’ province. On Tuesday 4th April, The Afghan Islamic News Agency reported that one of the houses of commander ‘Marwat’ was raided by the Special Forces in ‘Yalgi’ village of ‘Matoon’ area of ‘Khost’ city, in which, two women were martyred and two other women and a man were injured. It is worth-mentioning that assassin ‘Marwat’ is the commander of those notorious militiamen in ‘Khost’ province which are known as ‘Campaign Forces’. This militia force is formed and funded by the brutal foreign invaders. The above incident was also confirmed by commander ‘Faize’, the general security chief of ‘Khost’ province. On Thursday 7th April, nineteen civilian countrymen including local chieftains were targeted and relentlessly martyred in an indiscriminate drone strike of foreign invaders inside ‘Gomal’ district of ‘Paktika’ province. According to the local eye-witnesses, these people were travelling in three separate vehicles to solve a dispute between two local tribes when they became the victims of this savage attack. 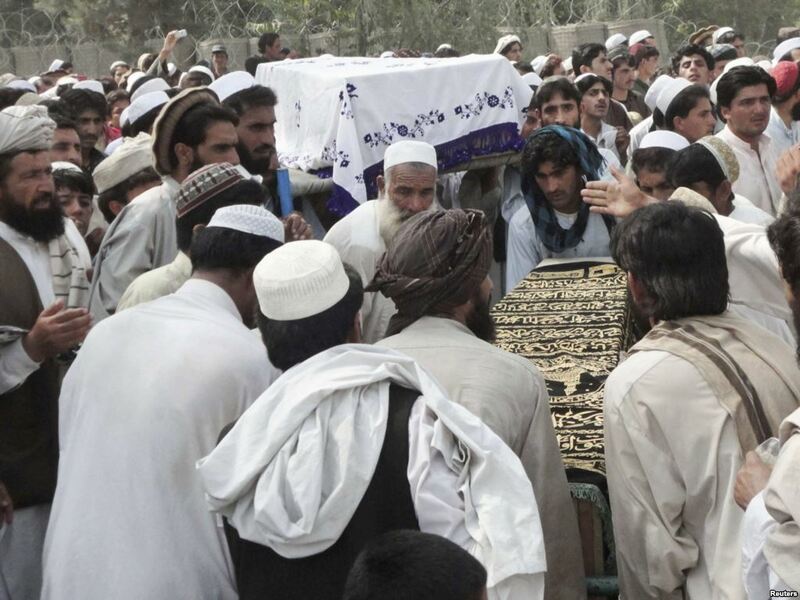 On Thursday 7th April, a civilian transport vehicle was targeted in another indiscriminate drone strike of brutal foreign invaders near ‘Pachir’ market of ‘Pachir Agam’ district in ‘Nangarhar’ province, in which, a religious scholar Moulave Abdul Salam and Pir Qamar-u-Din were martyred on the spot and three other persons were seriously injured. On Saturday 9th April, houses of local innocent people were raided by internal stooge soldiers in ‘Kata Khail’ area in the outskirts of central city of ‘Kunduz’ province, in which, numerous valuables from these houses were looted and ten ordinary villagers were taken away as prisoners by these mercenary forces. On Tuesday 12th April, a school was hit by a mortar shell, randomly fired by the internal amateurish mercenary soldiers in ‘Basram’ area of ‘Mehtarlam’ city, the capital of ‘Laghman’ province, in which, two teachers were martyred on the spot and three persons were seriously injured. On Tuesday 12th April, a local Mulla Imam (the one who leads congregational prayers) was brutally martyred and two ordinary civilians were incarcerated by the internal stooge special forces in ‘Sagi’ area of ‘Khakraze’ district in ‘Kandahar’ province. On Wednesday 13th April, a civilian Toyota type vehicle (locally called Saracha) was stopped and checked by unrestrained local Arbaki militiamen in a check-post in ‘Qatar-Block’ area of ‘Imam Sahib’ district in ‘Kunduz’ province. When this vehicle left the check-post, these Arbakis militiamen opened indiscriminate fire on it, in which, two ordinary travelers were martyred and four others were badly wounded. On Wednesday 13th April, sixteen innocent countrymen were detained and taken away as prisoners in the wake of a night raid of brutal foreign invaders collaborated by their internal mercenary forces inside ‘Haidar Abad’ area of ‘Grishk’ district in ‘Helmand’ province. On Thursday 14th April, an ordinary civilian, named Abdul Ghani, was relentlessly martyred by local stooge soldiers near ‘Sink’ check-post in ‘Qalat’ city, the capital of ‘Zabul’ province. On Thursday 14th April, ten ordinary countrymen were martyred and two others were incarcerated in the series of night operations of brutal foreign invaders with the collaboration of their internal mercenary forces in the outskirts of ‘Kharwar’ district in ‘Logar’ province. According to the local eye-witnesses, seven innocent civilian persons including women and children were first awakened inside their home by foreign invaders and their internal stooge soldiers, they indiscriminately opened fire on them, in which, all of them were brutally martyred. Similarly three persons of two other families were also martyred by these savage forces during these night operations. On Saturday 16th April, a twelve year old boy, named Nasir Khan, was ruthlessly martyred by the local unrestrained Arbaki militiamen to avenge the killing of their commander in ‘Grani’ area of ‘Bala Buluk’ district in ‘Farah’ province. On Sunday 17th April, the brutal foreign invaders raided civilian houses in ‘Viyani’ and ‘Landi Karaze’ areas of ‘Shah Wali Kot’ district in ‘Kandahar’ province, in which, transport vehicles of local people were burnt and two ordinary villagers were detained and taken away as prisoners. On Wednesday 20th April, two women were martyred and six other women and children were injured in the indiscriminate heavy artillery shelling of internal mercenary forces on civilian houses in ‘Dasht-i-Archi’ district of ‘Kunduz’ province. On Wednesday 20th April, four civilian houses were destroyed, in which, one innocent women and two children were martyred and three other women were seriously injured in the indiscriminate bombing and artillery shelling of internal amateurish mercenary forces in ‘Yamgan’ district of ‘Badakhshan’ province. On Wednesday 20th April, an ordinary countryman was martyred and another one was injured in the random heavy shelling of internal stooge forces in ‘Nahr-i-Sofi’ area of ‘Chardara’ district in ‘Kunduz’ province. On Wednesday 20th April, a ten-year-old boy was martyred in the random artillery shelling of local amateurish soldiers in ‘Jar Qala’ area of ‘Garziwan’ district in ‘Faryab’ province. On Thursday 21st April, three innocent civilians of one family were martyred and a girl was injured in the night operations of wicked local soldiers inside ‘Noor’ village of ‘Sabari’ district in ‘Khost’ province. Similarly, eight other ordinary countrymen were incarcerated in these savage night operations of mercenary local forces. The local eye-witnesses told media outlets that first their houses were thoroughly searched out, then they were relentlessly beaten; some of them were martyred and some other taken away as prisoners. Mr. Agha Jan, the head of this district also confirmed this felony of the internal mercenary forces. On Friday 22nd April, numerous valuables were looted from civilian houses by the unrestrained armed militiamen of notorious warlord ‘General Dostam’ in ‘Aqcha’ and ‘Mardian’ district of ‘Jozejan’ province. The innocent local people were relentlessly beaten up, in which, the arms of three boys were fractured. Similarly, five innocent countrymen were detained and taken away as prisoners. On Sunday 24th April, a teacher, named Khiyali Marjan, was cruelly martyred by the notorious local Arbaki militiamen in ‘Misk Karaize’ school of ‘Said Karam’ district in ‘Paktia’ province. On Friday 29th April, a white-bearded aged man of sixty years was ruthlessly martyred by the unrestrained local Arbaki militiamen in ‘Zabit’ village of ‘Gilan’ district in ‘Ghazni’ province. On Saturday 30th April, ‘Umar Zawak’, the spokesman of ‘Helmand’ province told media outlets that two children were martyred in a mortar shelling, randomly fired by the internal mercenary in-security forces in the south of this province.